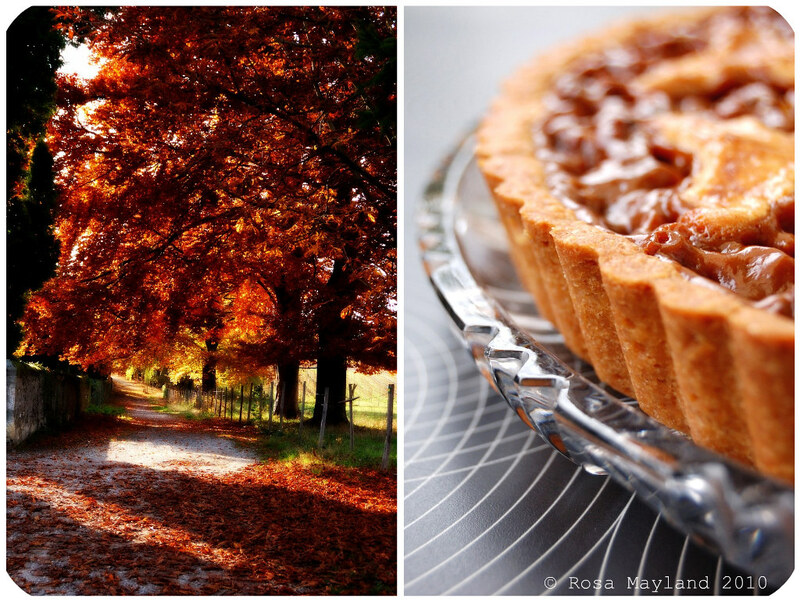 Rosa your walnut crostata is stunning I just love it and the photographs are so beautiful, well done on this challenge. Happy holidays to you and your family. Cheers from Audax in Sydney Australia. 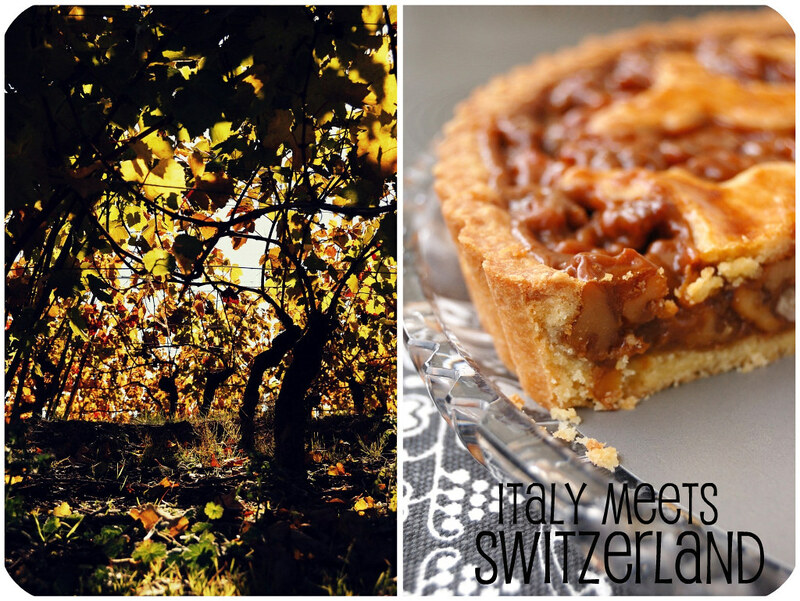 Your walnut crostata is simply AWESOME! I'm drooling here! absolutely gorgeous,a fest for my eyes and my soul!thanks! this filling looks divine, Rosa! Oh yum this sounds absolutely delicious! And looks gorgeous too. I must try it. oh la la Rosa, quelle tarte magnifique ! Le look est franchement splendide mais je peux aisément imaginer le goût ! It is easy to see why this would be a favourite Rosa. You do the DB's proud! I always think of a Crostadas a being rustic, Rosa, but this one is gorgeous!! You always make me drool! WOW! The surface of crostata looks awesome, and I thrilled with caramel and walnut filling. I Have to try! :) Wonderful photos! My absolute one bite and gone to heaven favourite!! Looks so pretty! Ta crostata est absolument superbe Rosa. J'aime beaucoup ta garniture aux noix. Elle devait être délicieuse! Beautiful tart! The torte you mentioned sounds delicious too. If the pasta frolla is too sticky, try to press it directly into the tart pan next time. You break it in small pieces and press it with your hands and fingers into place. Wow thats gorgeous , this is one of my another fav filling.. Seriously I am tempted again. And again, many beautiful pictures to please our sights, thanks! Perfect looking tart. You've mastered the art of baking ! Oh the texture is out of this world, the light hits it and you see all the nooks and crannies. I absolutely love it~! My Oma is Swiss and I want to know why I've never been introduced to the dessert with that filling! It sounds delicious.. what a beautiful tart and I think I'm in love with those little moose cut outs! Sweet memories and a beautiful tart Rosa. You got me with this walnut filling...Yum ! Sorry for my long silence, as I have been traveling since 6 weeks, and before that I was also not really that active in blogging, for preparations, and whatever other matters. What a challenge to bake an Engadiner Nusstorte, and how well you did! Great, would love to eat a piece now. 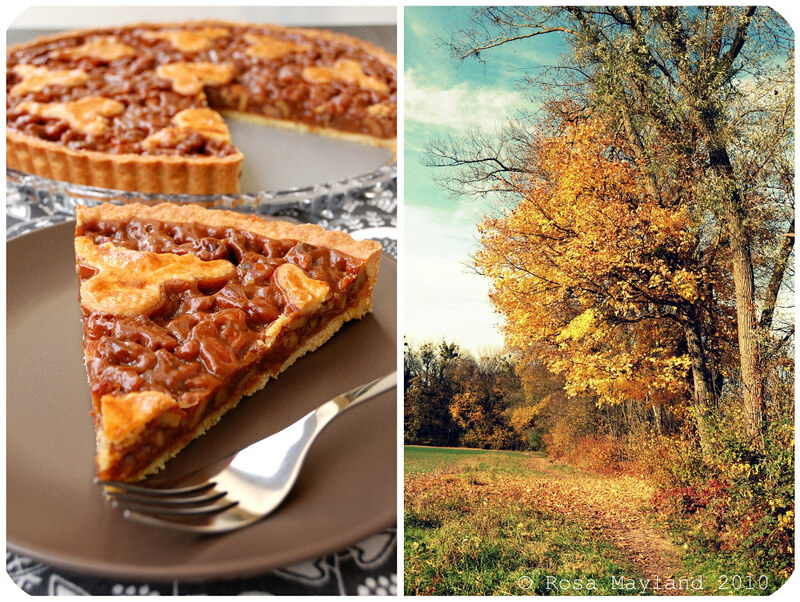 A la vue des photos, j'ai envie de cette tarte fabuleuse...trop belle, trop gourmande, trop tentante...! Je file la lire en français car je n'ai pas compris grand chose (rire) sauf que j'en ai envie ..;! What a perfect crostata, one of my favourite cakes/pies. I love the way you've adapted it and the personal significance for you of this recipe. Wow, 35km hikes,what keen hikers your parents must be. I have yet to try an Engadiner Nusstorte but this looks so tempting. Dear Rosa, this is simply gorgeous! Your crostata looks beautiful and sounds delicious! I would love a slice. Nice job on the challenge! your crostata sounds delicious. love the way how you made that toffe walnut sauce. Mmmm. . . engadiner nusstorte! Looks luscious--this is the first DB post that actually makes me want to race back into the kitchen to make another tart! There is a popular bar cookie that is basically this recipe, but made in a sheet pan and cut into bars. Sometimes they are drizzled with or dipped into chocolate. These are the best. Oh. My. Goodness. That looks sinfully delicious. I wish I could taste it through the screen. I have never heard of it before, but now really want to try it. The combination of the nuts and caramel just looks and sounds so amazing. That is great that you were able to use this challenge to relive a treasured childhood memory, too! J'ai juste envie de dire : AWESOME!!! Rosa, you are killing me! This filling looks divine. Exactly what I want to eat at this very moment. I remember having a very similar tart in the Dordogne. Mmmm I'll be making this for sure soon! That crostata looks out of the world! oh wow! The tart is stunning. You should be very pleased with yourself. Awesome! One of the prettiest tarts I have seen around. This looks amazing. Will have to try it soon. This is some mouthwatering crostata. Glad I found out about your blog! I love your story about the crostata filling--I can practically taste it already! You've succeeded in making me incredibly hungry. I'd love to give this a try! Great job on this challenge! Fabulous food paired with outstanding photography. Bravo! Your version of crostata is just heavenly! 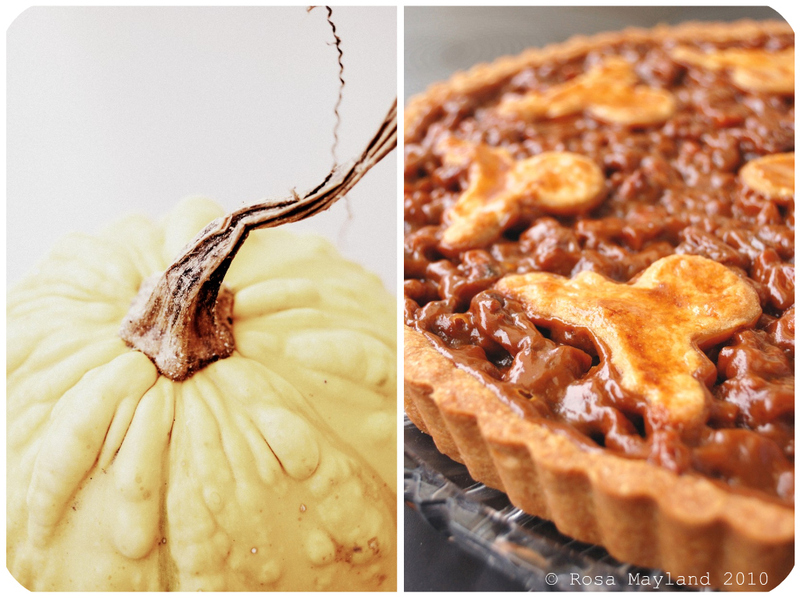 I love walnuts in pies, and I think your recipe tops all the recipes I've seen for walnut pie. Excellent job and pictures! Une merveille qui vient à point par temps de neige ! Rosa this is so lovely. I have never even had a tarte like this before, I will have to try it! This is beautiful, Rosa. It kind of reminds me of a European version of a pecan pie (with a different nut). Oh, and it looks so Christmas/Holiday-like. I want a slice...! Looks so so beautiful and they are just bursting with walnuts. DELICIOUS. Made and presented as only Rosa can! That is one cool looking pie! It almost looks like meat. Nice job! Tu as tout à fait raison d'être fier de toi. Tu le mérites bien. Le résultat est superbe. Les photos ne mentent pas. Waow, this is an amazing version of the Engadiner Torte! I love your decorations on the top and all these beautiful pictures! My heart just skipped a beat after seeing this wonderful picture of crostata :)..AMAZING!! Rosa, this looks AMAZING, I really really love it! Any left?! Childhood recipes are so comfort! Love to "hear" something about your childhood! I could taste the pie's flavor! I must try these recipe soon! Is a good way to know something about other culture! Very nice idea to mix Italy with Switzerland! It does look flawlessly beautiful Rosa - and I could not resist a caramel tart! 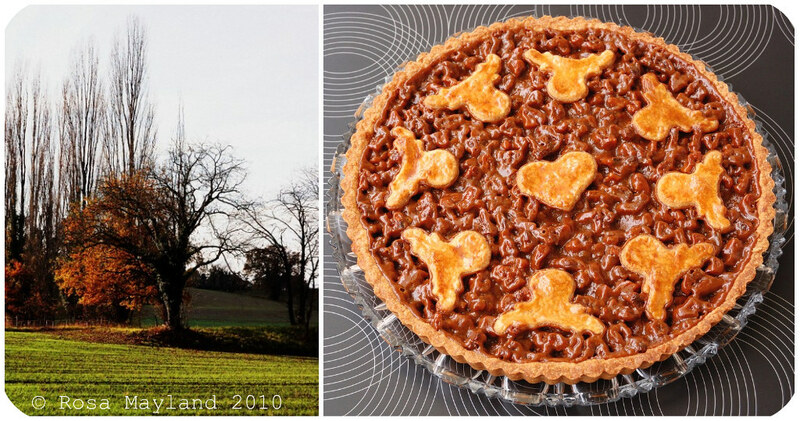 Love your background story too - glad you can recreate the tart of your youth. Wow, Rosa, this is really stunning! You did a perfect job on your crostada! Walnuts? I love your crostata! Such a unique crostata! It looks beautiful and it must taste incredible! Beautiful is right! Love the cutout design of the top. The crostata looks amazing! Thanks for the recipe. Bookmarked it for later use. Hope you're having a wonderful day. Je ne peux pas manger ca, c'est bien trop sucre pour moi. Mais je dois reconnaitre que les photos sont splendides. I think yours is the prettiest version of the challenge.. awesome dessert and photos... it must taste amazingly good! I can imagine your memories of the pastry must be extraordinary with that history of walks in that heavenly area to remind you! You're a master of photography! Stunning shots. Your Crostata is absolutely heavenly! yum, that looks very good! great job on the the challenge and the photos are great too. Beautiful crostata! C'est très jolie! I am new to the blogging world. 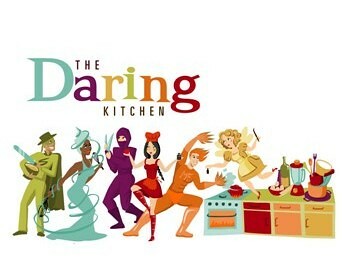 I will have to check out Daring Bakers because I love to bake anything sweet or savory:) Thanks for sharing. Je n'ai jamais goûté à la Crostata. Cela semble sublime. Maintenant je veux vraiment en faire. Superbes photos. The crostata looks so delicious and the pictures amazing. A foodblogger friend has passed on to me the One Lovely Blog Award and I would like to share it with you. Check it out here http://fragoleefarfalle.wordpress.com/2010/11/30/one-lovely-blog-award/ Thank you. This looks great Rosa, love walnuts and so wish someone made this for me! Coz I'm jinxed when it comes to tarts! Oh, this looks amazing! Beautiful photos! ahhh, 7th heaven indeed! what a lovely memory, I can just imagine the vistas... and I certainly wish they made such a delectable sounding pastry here in the states. vat a wonderful work rosa!! drooling!! That has pecan pie beat by a mile. Yum! Ce billet est magnifique et tellement gourmand! La crostata c'est toute mon enfance...et aux noix, ça ne peut être que délicieux!!! Bises. Rosa, another stunning, gorgeous dessert! You never fail me, do you? And I'm always glad to watch you trying things you were always afraid to try: it inspires! This is truly a fabulous crostata with a wonderful story behind it. what a marvelous and exquisite tart, rosa! the filling is absolutely fantastic. 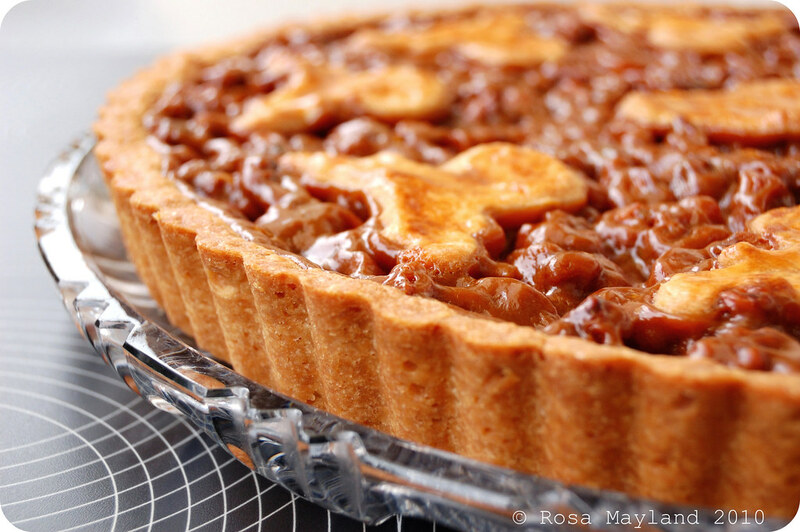 WOW, that is one stunning tart..errr..crostata, and the walnut - honey filling is perfection. I love ooey gooey with nuts, and I'm definitely trying this soon! Gorgeous photos too! 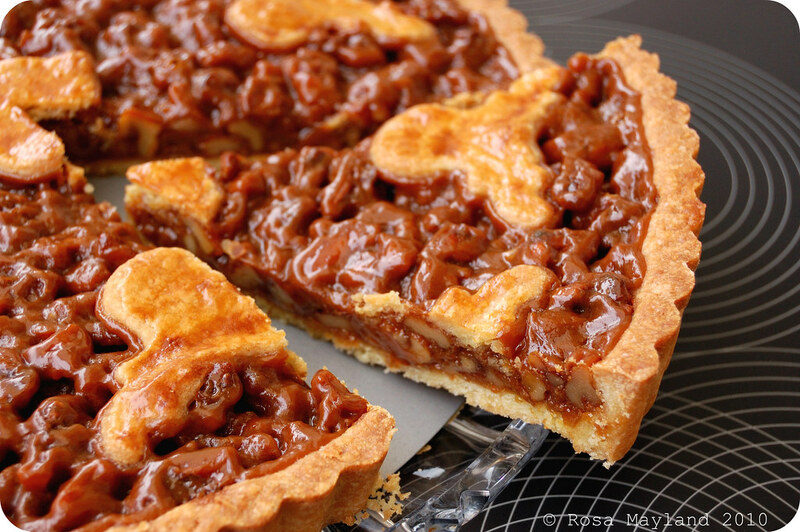 Oh my, forget the pecan pie - I'll have a slice of that walnut tart ANYDAY instead. Now, there's a slice of paradise I wouldn't mind having this morning! A gorgeous dessert. You should be very proud. I can't believe your pastry didn't turn out as planned - it sure doesn't look that way! The filling's not too sweet though? beautiful creations as always!! i love it.. thanks for sharing this .. i would love to try this out someday. This crostata came out perfect, your dough everything about it is so very impressive. I made a lemon curd one recently and while it looked ok and the flavor was incredible it didn't look anything like this one.